I'll have some Dedicated Servers with Ketchup please. Picture this senario: You're down to the wire. Two players left and you have managed to Torque Bow one." Sudden Death!" You press back on your controller to see if you have a chance against the last standing player. Your heart drops, he is 13 and 3. You soon realize that he is headed your way and you active reload your shotgun. "Boom! Boom!". You shoot two shots off, dead center to no avail. "What!" you scream. Your opponent shoots one shot off into your foot and pieces fly everywhere! Your foot for heaven sakes! You know why this shinanagans happens? Because Epic Studios -in all their glory- made a big uh oh. They allotted the player with the best connection to host the match. Meaning, that they will have a stronger weapon and will be a tad quicker, giving them the advantage. "In addition to a swath of online code improvements, we’re bringing dedicated servers to Gears of War 3 to drive a balanced, optimized, and thrilling online experience for Gearheads everywhere". Everyone now is equal. So you better come in with A game. 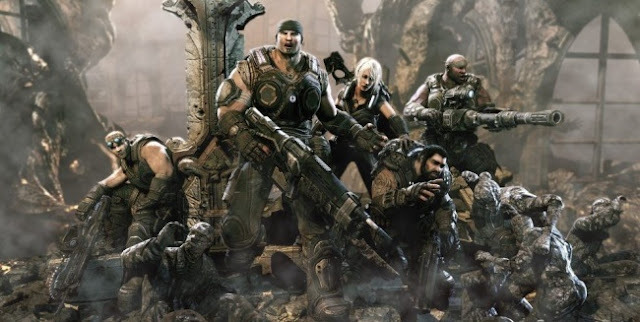 In Gears of War 3 you'll win or lose totally based on how well of a player you are. Are you up to the challenge? Thanks IMurkedU - I gotta feeling there's gonna be a million or two gear heads up to the challenge. Do you want to write your own guest post for Gears of Halo? Find out how in the Guest Post Section. DLC for Mass Effect 2 called The Arrival? Gears of 3 Release Date Confirmed. Diablo 3 coming to a console near you? DLC for Halo: Reach is called "Defiant Map Pack"? Bad Englund Confuses Bungie fans? Gears of War Kinect to be set on a train? Is Joseph Staten actually the Master Chief? Want a job making the next Halo game?